Spend more time doing what you do best: Manufacturing. If your company is looking for a more efficient way to keep track of industrial supplies, then it’s time to call in the pros from Cline Tool. We are the Midwest’s leader in providing Integrated Supply Systems -- we know how to manage all your purchasing and sourcing needs. That way, you can focus on manufacturing. And you can be assured that we’ll focus on keeping your operation running efficiently and profitably. We’re a manufacturer too. So, we know that reducing downtime is critical to lowering your cost per unit. That means the most cost-effective supplies need to be in stock and in the right place at the right time. Ordering is simple and quick with our integrated supply systems. Cline Tool’s state-of-the-art technology makes sure orders get processed immediately on our end so your operation stays running. Tracking costs is important, and our on-line reporting makes it easy. Now, you’ll have the visibility to tie usage and consumption to individual jobs and inventory turnovers. You’re unique. Let our expert engineering staff review your operation and customize a solution just right for your business. We’ll look at everything, from process improvement and inventory reduction to supplier consolidation. Together, we’ll determine which system fits your floor plan, tool and supply demand levels. You can choose from several options/size configurations, including AutoCrib Automated Dispensing Units – vending machines, cabinets, lockers, stand-alone robotic tool cribs -- or hand-held scanners with on-site personnel. Cline Tool knows what it takes to make the installation and integration into your organization go smoothly…but that’s just the beginning. We become your partner in forecasting supply needs, cutting waste and streamlining processes. The Cline Tool Promise is to find measurable cost savings for you year after year. Control Wasteful Usage - Point-of-use systems typically reduce overall consumption by 20%. Reduce Inventory - Demand-Based Inventory Management Software allows most users to cut inventory up to 20%. Reduce Obsolescence - Increased visibility of slow and dead inventory. Most shops see obsolescence reduced by 50% after implementing industrial vending. Reduce Tool Spend - Use regrinds and reconditioned items first, before allowing access to new items. Reduce or Eliminate Stock Outs - Cut spend on unnecessary overnight shipments and duplicate tools and supplies. 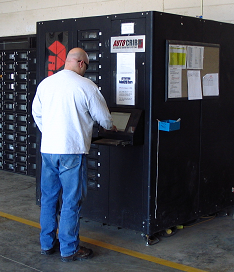 A real-time inventory count is always available from any AutoCrib system. Reduce Downtime and Paperwork - Automatic re-order and on-time delivery so you'll never be out-of-stock. Point of Use Automated Vending Improves Production Efficiency - Reduce the average roundtrip time to a tool crib from 15 minutes to 4 minutes. Make tools and supplies available 24/7 while maintaining security. Contact us today to learn about all the ways Cline Tool can deliver measurable cost savings and improve productivity. Visit the AutoCrib website for additional product details.